A friend who works at Chicago Shakespeare Theatre confided to me that the sassy Sicilian diva has signed on to play the caustic Phyllis stone in Gary Griffin’s Fall 2011 mounting of Stephen Sondheim’s Follies. There’s talk that Sondheim will also pen a new number for Phyllis that will replace all three possible ‘Phyllis Follies’ numbers (“The Story of Lucy and Jessie,” “Ah, But Underneath,” “Uptown, Downtown”). I hear it will involve a strip scene, an onstage breakdown and a tuba. 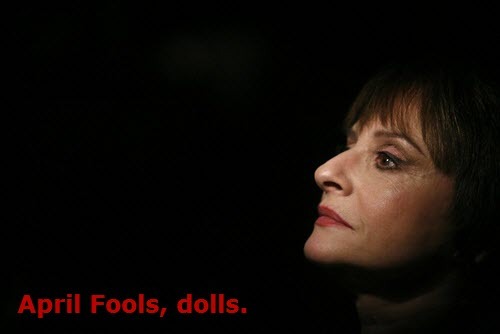 (Please, Ms. LuPone: this was a joke. No need to stop any performances or storm any headquarters demanding my blog be taken down). PS: I know — I’m so lame. But what if? I AM BEYOND PISSED! totally fell for that. please fall down a flight of stairs, thanks. But maybe me putting this out into the ether will make things happen? You know? Drats! I just went and told my partner about Patti in “Follies” and then read the rest of your post. You certainly fooled me. I love it! Belated April Fools, Marc!